I don’t know if Communist Chess is a good name of not. It certainly holds the biased connotation associated with the word communism. The idea of this game came in to my head while I was travelling through Vietnam. 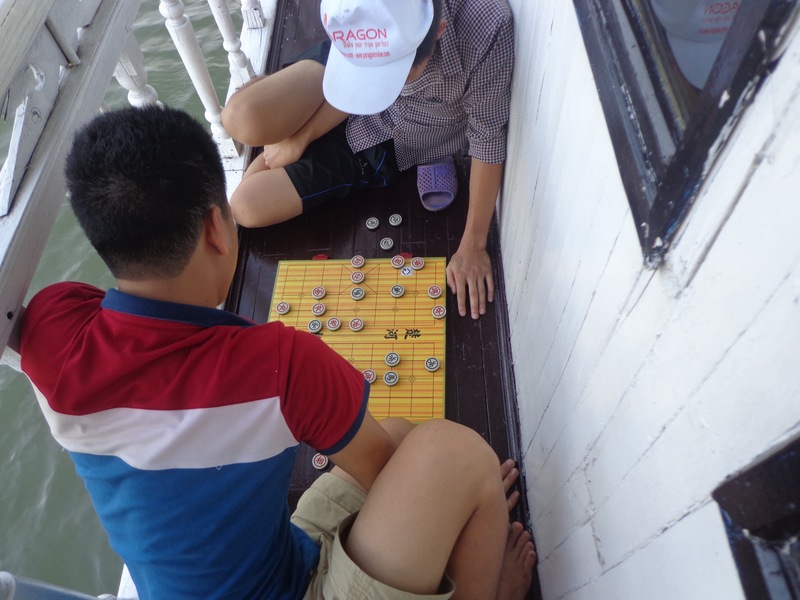 I saw people playing Xiangqi. Since I did not know the rules, I was amusing myself with made-up rules. In no time I was paying more attention to the consistency of my own made-up rules than the actual game going on in front of me. There are eight policy makers and n[note] pawns. The pawns movement area[note] is separate from the policy maker’s movement area. The game is played until all pawns on one side are converted by the opponent or one of the players resigns. Pawns are like coins with a colour on each side. One side plays with Black+Blue and the other side plays with White+Red. The game starts off with White and Black sides facing up. A pawn can move one or two steps in a direction decided by the policy maker. A reluctant pawn (definition in point 5) will move only one step. A pawn can be captured when opponents pawn jumps over it. Then the captured pawn is flipped over (White->Red and Black->Blue) and is named as a reluctant pawn. The reluctant pawns are controlled by the capturer. A reluctant pawn can be recaptured by the opponent. Once it is back with its starting side, its movement becomes normal. A player can either move the pawns or the policy makers. A policy maker, when on a designated seat will dictate the movement. N->S, S->N, E->W, W->E, NE->SW, SW->NE, NW->SE, SE->NW. Pawn capturing jumps can be as many in the direction of policy. A policy maker may be absent from the designated seat. This can last for only two moves including the one which causes removal of the policy maker. This situation is called lawlessness. In lawlessness, a pawn irrespective of being original or reluctant can move only one step in any direction. However it can chain jumps combining any direction like Chinese checkers. My friends have been quite reluctant to entertain this idea. They think of my ideas as over-the-top / crazy / non-conforming, etc. Hence, I haven’t been able to really discuss on the feasibility or deadlocks arising from these rules. The size of the board and the number of pawns on each side is not yet fixed. Unless a few games have been played, it would be difficult to settle this. As a starting point, the board size can be 8×8 like standard chess with a additional 3×3 space to house the 8 policy makers and the central slot marked as designated seat. No. of pawns can be set as 16 arranged in 2×8 fashion just like chess. However, I feel that reducing the number of pawns would make the game more interesting as that would leave a lot of place for the pawns to jump around.